At Daunt Books in Marylebone High Street last Thursday evening, Times cartoonist Alex Williams celebrated the launch of his latest book The Queen’s Counsel Official Lawyers Handbook, a satirical guide to the perils and pitfalls of a career in law. Alex was (briefly) a barrister, before fleeing the law to become a Hollywood animator, but he still writes and draws the weekly cartoon strip Queen’s Counsel in The Times, gently poking fun at his former colleagues. 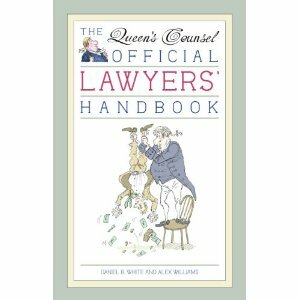 Alex’s latest book – packed with Queen’s Counsel cartoons – is a journey through the hazards of a legal career, but like the best satire it’s funny because it’s often very close to the truth. There’s more insight into the legal life here in this book than in a library full of earnest law books – and it’s a lot more fun to read. Among the guests were Morgan O’Sullivan, Producer of King Arthur and Angela’s Ashes, Duncan Heath, Chairman of Independent Talent (Europe’s largest talent agency), and Posy Simmonds, graphic novelist and author of Tamara Drewe, recently made into a hit movie by Steven Frears.